Non-medicinal ingredients: microcrystalline cellulose, sodium stearyl fumarate. Capsule: hypromellose. AOR™ guarantees that all ingredients have been declared on the label. Contains no wheat, gluten, corn, nuts, peanuts, sesame seeds, sulphites, mustard, soy, dairy, eggs, fish or shellfish. 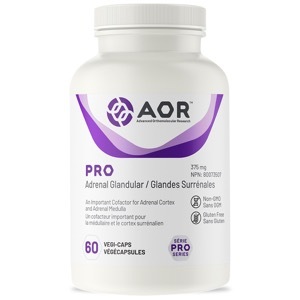 AOR's Pro Adrenal Glandular offers targeted adrenal support without concerns of herbal interactions. It contains a corn-free source of the powerful antioxidant vitamin C to improve adrenal functioning, combined with a high dose of porcine derived, hormone-free adrenal cortex glands from Denmark. In stressful situations, adrenal functions may be compromised. Therefore, for optimal stress support, it is important to provide nutrients and cofactors to improve adrenal functioning. AOR's Pro Adrenal Glandular helps provide a boost to these functions, with a herbal adaptogen-free formula, reducing the risk of adverse reactions. Porcine-sourced, freeze dried adrenal cortex helps eliminate the risk of BSE. The vitamin C sourced from tapioca also helps limit potential patient sensitivities. Adult Dosage: Take 2 capsules daily with/without food. Pregnancy/Nursing: Insufficient evidence to support use.